Area law enforcement agencies submit unsolved crimes to Crime Stoppers in an effort to obtain information that could help close the case. Below you will see a number of cases submitted by officers; at the bottom of each page is a “next” button that will take you to more unsolved crimes. Be sure to check out the videos and some the photographs can be enlarged by clicking on them. The Fort Mill Police Dept. 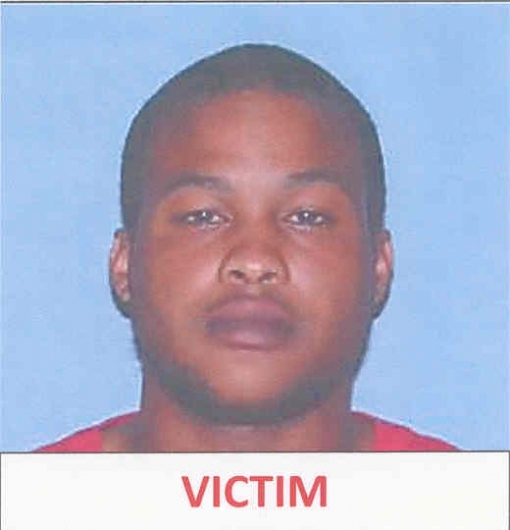 requests your assistance in providing any information regarding a homicide that occurred on June 4, 2015. On that date, La`Charles "Tae" Govan was murdered and his body discovered on the lawn of Jerusalem Baptist Church, 1003 Steele Street, Fort Mill, South Carolina. If you know who committed this crime or have any information that can help investigators you`re asked to call Crime Stoppers of York County at 1-877-409-4321 or click SOLVE THIS CRIME. You don`t have to give your name and you could earn a reward up to $1,000. Witnesses told police that two suspects were seen running from the area, wearing camouflage but at this time, very few leads exist. 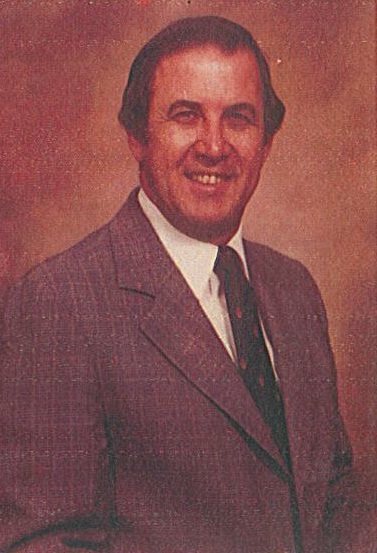 Mr. Heath was the father of 7 children. Someone knows the circumstances surrounding this senseless crime and that person or persons should come forward to assist law enforcement authorities. The Fort Mill Police Department needs our assistance in the investigation of a homicide that occurred during the evening hours of December 14th, 2013. Reginald Javonte Strother and Steve Anthony Vandross were killed during an altercation while at an event located at the Fort Mill National Guard, 276 Munn Rd. This case remains under active investigation and authorities are hoping that someone from the public can assist in this investigation. Of note, there is a possibility of an enhanced reward, if tips lead to the arrest and location of the persons who committed this senseless crime. If you can assist or have any information that you feel would assist in this investigation, you are urged to contact the Fort Mill Police Department or Crime Stoppers of York County OR click SOLVE THIS CRIME. 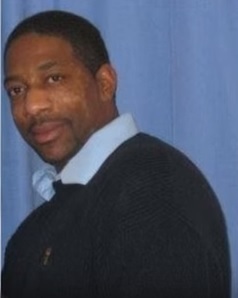 Melvin L. Roberts was murdered on February 4, 2010 at approximately 7:30 pm at 214 Roberts Avenue in York, SC. Julia Phillips was charged with the murder. Through the investigation, it is believed that at least one or more people were there at the time of the murder. 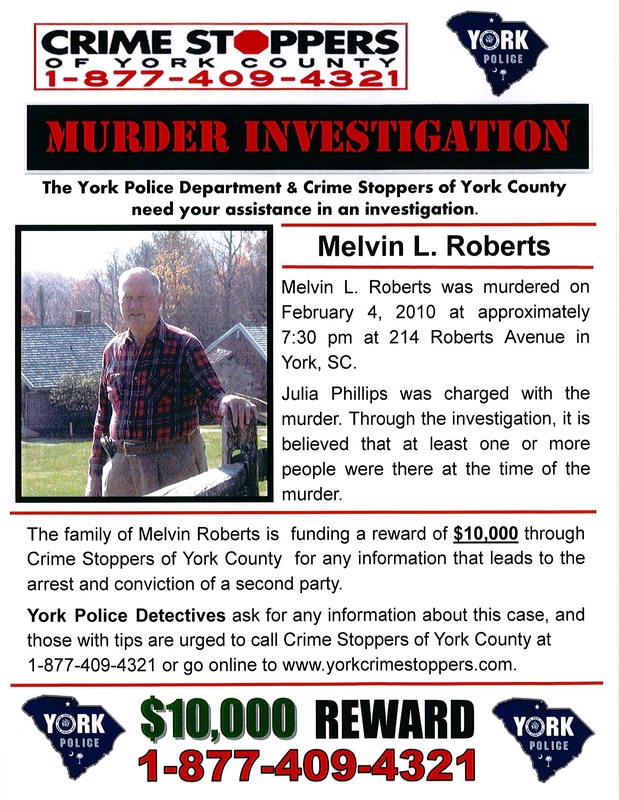 The family of Melvin Roberts is funding a reward of $10,000 through Crime Stoppers of York County for any information that leads to the arrest and conviction of a second party. Officers are asking for any information that might help identify the person who shot and killed Malek Salem who was working at the Pride Station on February 28, 2010. The victim in this case was shot at point blank range and pistol whipped as he lay on the floor of the convenience store. Officers are asking for any information that might help identify this suspect, or help them locate the car the suspect was using. The suspect is shown in the surveillance images and the suspect may have been stabbed by the store clerk. The vehicle the suspect was operating is a small to mid-sized four door car; the car is red, or burgundy with what looks like a gray interior. The car has a spoiler on the trunk and, at the time of this murder the car had a hubcap missing from the rear passenger side tire. Officers are investigating the death of Darrell John Vanderpool. The 23-year-old Rock Hill man was found by officers on the back porch of a mobile home in Shadow Lane Mobile Home Park in Rock Hill. Vanderpool had been the victim of an apparent gunshot. This shooting happened sometime around noon on Monday, August 4, 2008. Officers are asking that any witnesses, or any person who has information about this case call Crime Stoppers at 1-877-409-4321 and give the information. When you call Crime Stoppers, you do not have to give your name and you could get paid a reward of up to $1,000. On June 17, 2006, 17 year old Edgar Eubank “Banks” Montague was found injured and unresponsive in his Banks Street home. As a result of his injuries, “Banks” passed away in September of 2006. The Fort Mill Police Department continues to investigate the death and is asking for the public’s help. If you have any information that could possibly help solve this case, you are urged call the tip-line at 1-877-409-4321. 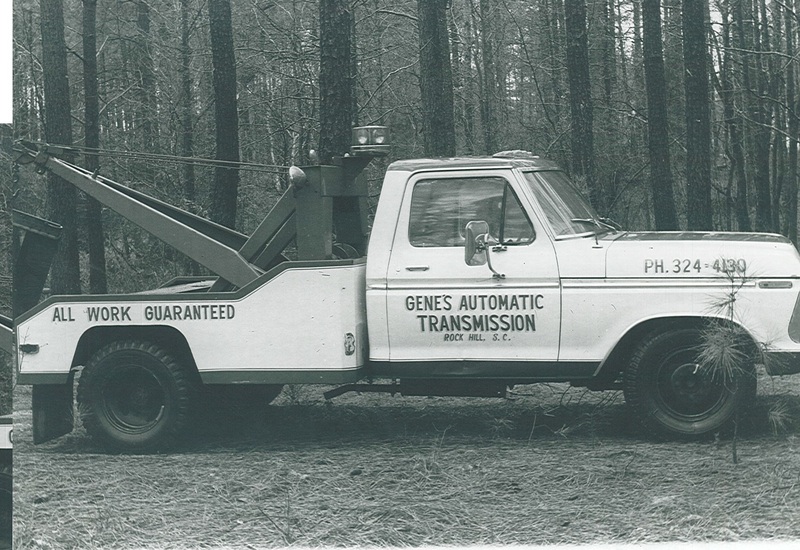 Gene Campbell operated a wrecker service in Rock Hill, SC and disappeared on a service call. His body was located 2/21/1998, sixz days after he was reported missing. Campbell had been shot to death and there had been an attempt to cover his body with tree limbs and pine needles. Campbell was 55 years old at the time. 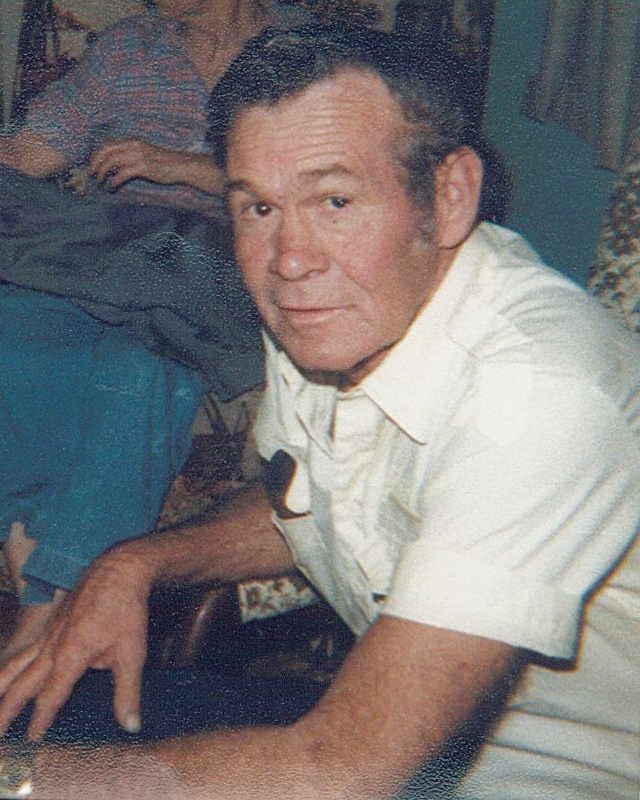 Harry Caraway was the manager of the Yellow Freight terminal in Rock Hill, SC. His body was found at Yellow Freight on Easter Sunday 4/11/1993. 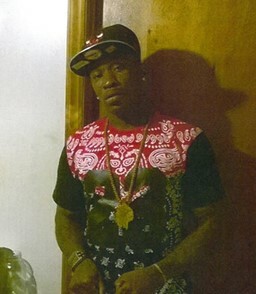 Caraway had been shot to death after an apparent struggle. On August 12, 1992, the body of an infant was found floating in the Catawba River between Rock Hill and Fort Mill. The infant was only hours old when she died from injuries sustained after birth, but not from drowning. The infant girl had red hair. 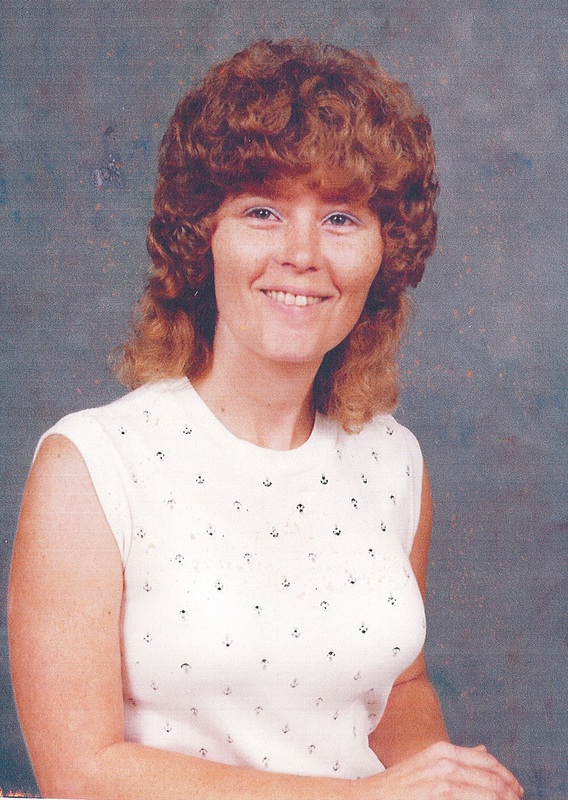 On October 4, 1986, Rennie Rinehart was leaving to go to work at approximately 10 o`clock at night when she was shot and killed out front of her home on the corner of South Anderson Rd. (Hwy. 21) and Hall Spencer Road in Catawba. 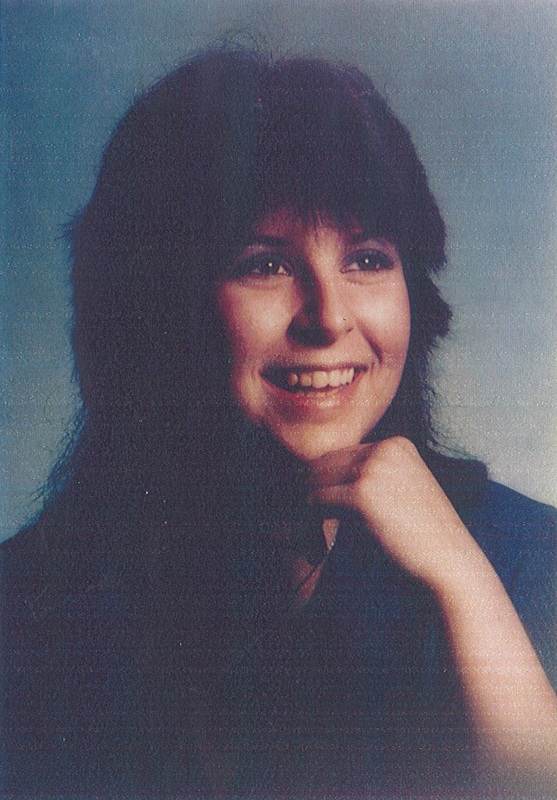 On April 23, 1986 Heather Hamilton was reported missing. 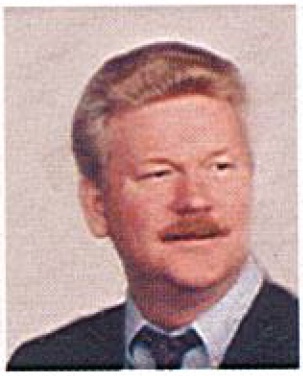 On September 3, 1986, five months later, Hamilton`s body was found in a wooded area off Neely`s Store Road in the Lesslie area of York County. Hamilton appeared to have been shot twice. The body of Frank Biggers, 56, of Clover was found on May, 18 1983 in a small thicket near the woods off White Wolf Road in Clover. Biggers had been reported missing 15 days earlier. 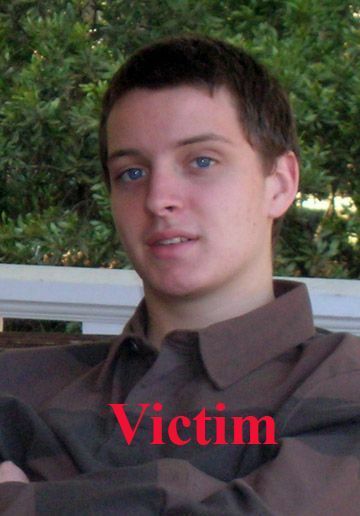 The investigation showed that Biggers died from a shotgun wound to the back of the head. On November 20, 1982 Glibert "Buddy" Mills, 50, of Fort Mill, SC was found in his car dead from a shotgun wound to the back of the head. Mills` body was discovered by a passerby on Steel Street in Fort Mill. 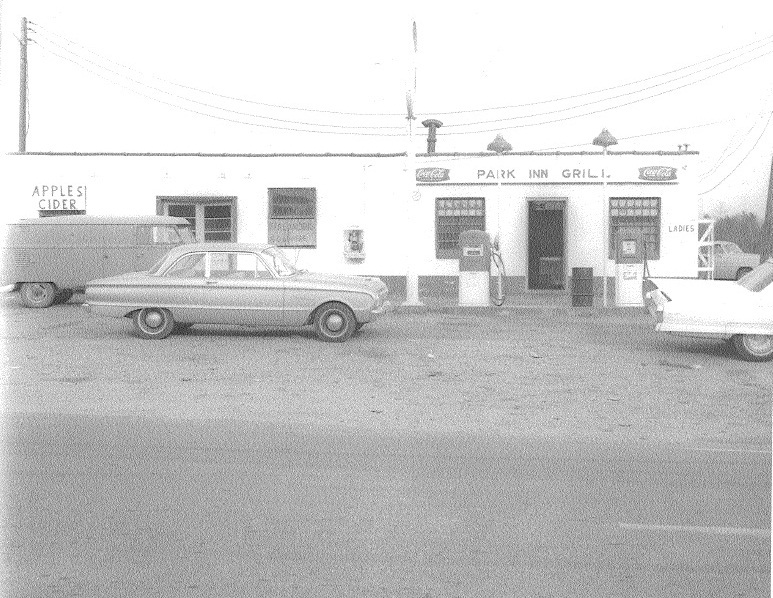 On Dec. 21, 1966 Charles "Charlie" Wells, Sr. 62 was closing up the Park Inn Grill off Highway 161 in Clover around midnight when he was shot and killed during an armed robbery outside the restaurant. A second person was also shot and survived. A witness saw two suspects leaving in a car towards Kings Mountain, NC. The suspects got away with $86 in cash and change.